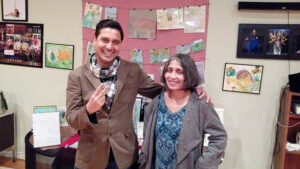 Kolkata/Seattle: IIT Kharagpur alumna Jayasri Talapatra Gill, no longer looks stressed. 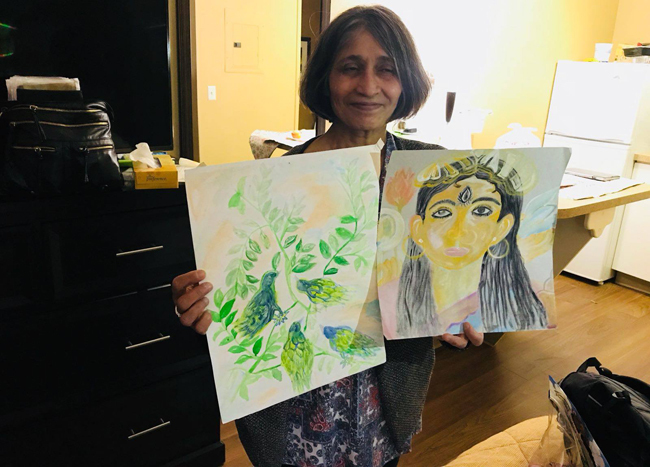 The strain, anxiety and insecurity, which was visible last time, when eNewsroom reported about her being spotted on the streets of Seattle, Washington selling paintings to survive, is now replaced with a warm smile. Since the story of Jayasri being discovered by a Texas-based businessman, Prabhat Page, got highlighted, help has been pouring in from all quarters, for the IITian. With the news of her being in distress, IIT Kharagpur alumni association got into action. A WhatsApp screenshot shared with eNewsroom by another alumna via Twitter shows the dedication with which the alumni association is working to get things rolling for a fellow IITian. “Today was a great day. The best part of today’s discussion with the alumni group was that everyone has agreed that our first priority for Jayasri is safety, shelter, food and human contact. We cannot leave her alone,” read one of the message shared in the WhatsApp group of the alumni association. Help Jayasri campaign began when IIT Kharagpur’s director got to know about Jayasri’s condition. He immediately jumped into action and contacted Ron Gupta; an IITian settled in Washington DC and asked him to take complete care of Jayasri. The director’s personal involvement made the ball roll faster. Constant networking with Indians and IITians settled in America saw many coming to Jayasri’s aid. Soon, a local Indian lady volunteered to host Jayasri at her house for a certain period, while another Seattle-based IITian paid to extend Jayasri’s stay at her current location for another week. 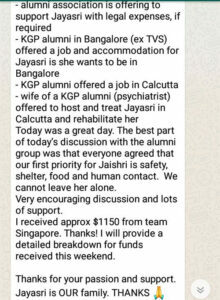 Meanwhile, in India another KGP alumnus has offered a job and accommodation to Jayasri if she wants to be in India. 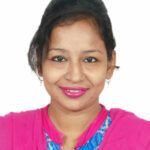 Also a wife of another KGP alumni based in Kolkata, has offered to host and treat her in Kolkata. The Singapore chapter has even raised approximately $1150 for Jayasri. Amid all the help extended, perhaps the best thing that happened for Jayasri was the exhibition organized by the local Indian group to exhibit her paintings. The photographs of the exhibition, shared by Prabhat on his Facebook page shows a happier Jayasri, proudly exhibiting her artwork. A closer look at the sketches or paintings made by the IITian, is like an open window to her experiences. The paintings reflect smartness, culture, rough time, pain, anxiety, hope, spirituality and sweet memories. The fact that she had so many people coming in to extend their support left Jayasri overwhelmed. “A small group of local women from Washington proved to be the real face of humanity, who deserve(s) a big salute and great respect. These women came to help Jayasri T Gill by raising funds by selling her hand made painting through an exhibition last week. This is also a message to this society who keeps their eyes shut for people who need help. Their first priority is safety, shelter, food and human connections,” wrote Prabhat on his FB post. In his post, he even thanks the IIT fraternity for expediting the documentation process in India and US. Even the message shared with eNewsroom, mentions that the Vice-council for passports from Indian Embassy SF had contacted IITKGP alumni association for documentation. The FB post of Prabhat however, indicates that the procedure could take time and that without proper documentation survival in the United States gets a bit difficult. The curious case of BJP parliamentary candidate’s election funds!